These adult-sized armwarmers have a patterned back, with a plain palm for practical use. Although they are fingerless, there are short open thumbs in the design to help keep the warmers in place during wear. 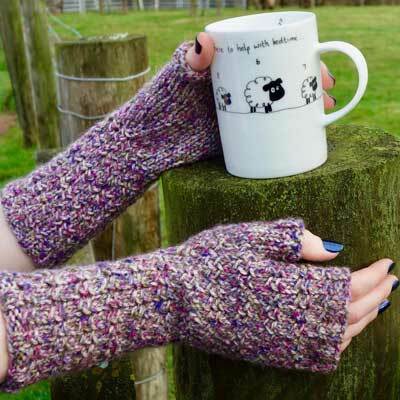 Being designed to keep arms as well as wrists warm, these are longer than our fingerless mittens; although you could easily work fewer rows if you prefer! They are knitted in aran weight wool so are quick to complete. Instructions for two sizes are given (S/M and M/L). The kits are currently available in two different shades of Shetland Tweed wool. The kits contain 100g pure British wool, along with full instructions. To knit the armwarmers you will need a set of 4 mm double pointed needles.